The future at your fingertips. Behold the incredible new Innovision Cockpit. 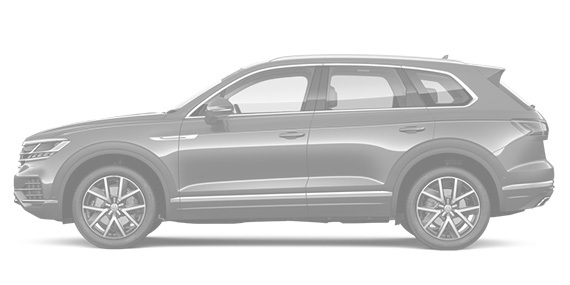 Exclusive to the Touareg, it features a large 15-inch screen, with an interface you can customise, that connects to a 12-inch digital instrument cluster. The Innovision screen is angled towards the driver, giving you an ergonomically optimised display that puts everything you need within easy reach. The system also features App-Connect, which allows you to mirror selected apps from your smartphone. For the ultimate in luxury and comfort, the new Touareg's seats offer heating, backrest and side bolsters, complete with three individual ventilation settings. They also offer a relaxing massage function, with the option of eight different massage patterns created by air cushions. Helping you to arrive at your destination feeling fresh and relaxed. The Touareg's IQ. Light LED Matrix headlights are like shining a spotlight exactly where you need it. LED matrix technology is paired with a camera that detects what's happening on the road, and the car adapts the light distribution to match. If the camera sees a road sign, the segment that illuminates the sign will be dimmed to avoid dazzling you. It can even adapt the breadth, throw and intensity of the headlights in bad weather, to prevent dazzling oncoming drivers. The Touareg's generous proportions give you the freedom to move. The impressive boot space, combined with the sliding and foldable rear seat, make it hugely flexible. And for even more convenience, you can use the Easy Open electric tailgate to open the boot with the touch of a button or even with a kick of your foot.